This week’s lesson focusses on some of the persecutions and retaliations which Jeremiah experienced at the hands of Judah’s king and leaders. It makes two overarching points. First, Jeremiah—and all of us—was and are living out the the great controversy in our lives. We are in and shaped by this supposed great controversy, and our lives contribute to its outcome. Second, God’s promises and threats are conditional upon human response. The lesson makes the point that while God knows all people’s decisions in advance, His foreknowledge does not change our ability to make our own decisions. Furthermore, it stresses that if we repent and leave our sin, God’s warnings of punishment will be reversed in regard to our own lives. Finally, the lesson stresses that people suffer for their Christianity, and the Teachers Comments (p. 69) ask the class to think of a time when they experienced “strong opposition” for being a Seventh-day Adventist and asks how such opposition ought to be handles. It is important to realize that Jeremiah was not living out “the great controversy” as Adventism describes it. Adventists like to argue that the term simply represents the evil influence of Satan in the world opposing the good influence of Jesus as the two beings fight for the souls of men. The way they describe this conflict publicly, many Christians are unaware of its true definition and meaning, and they might agree. And you, who were dead in your trespasses and the uncircumcision of your flesh, God made alive together with him, having forgiven us all our trespasses, by canceling the record of debt that stood against us with its legal demands. This he set aside, nailing it to the cross. He disarmed the rulers and authorities and put them to open shame, by triumphing over them in him (Colossians 2:13-15). Satan has never imagined that he could be considered a legitimate opponent of Jesus. Satan knew that Jesus was his creator, the LORD God who was his sovereign. Yes, Satan opposed Jesus by rebelling and refusing to obey and be thankful to Him, but he has never thought he was legitimately equal to Jesus naturally. Ellen White’s descriptions of Lucifer’s jealousy when the Father supposedly exalted Jesus to the position of His Son and brought Him into the council of God, snubbing Lucifer by not inviting him in, are completely extra-biblical and opposed to Scripture. These ideas are heresy, and Satan has never believed he and Jesus were on an equal playing field. He has always known he was an angel and Jesus was his Creator. Furthermore, Ellen’s explanation of the great controversy involves our faithfulness to obey Jesus and keep the law in order to demonstrate to Satan that God’s law is just and fair, thus proving to a watching universe that Satan is a liar and a false accuser. By choosing to obey God, we help Jesus win the battle of the great controversy. We add evidence to God’s cause and thus disprove Satan’s accusations. Again, this idea is completely unbiblical. We prove nothing to Satan, nor do we disprove him. Furthermore, there is no watching universe of creatures waiting to see what will happen. The Bible reveals that only the angels long to look into the matters of our salvation (1 Peter 1:12). Our obedience is only something between us and God. In fact, because we are born spiritually dead into the domain of darkness and under Satan’s control from birth and condemned to eternal death (Eph. 2:1-3; Col. 1:13; Jn. 5:24), we do not make a choice between God or Satan. We are unable to choose God because we are born utterly dead and depraved, controlled by Satan. And he said, “This is why I told you that no one can come to me unless it is granted him by the Father.” (John 6:65). We can only choose to trust Jesus after the Father has intervened in our spiritual death and subservience to Satan. The lesson points out that God honors people’s choices to believe. If they repent of their sin after hearing a prophetic message, they can reverse the prophesied punishment that was to come. What the lesson fails to explain, however, is that God covenanted with Israel that He would punish them for disobedience.He said He would bless them for obedience, but He would ultimately exile them for persistent unbelief. This latter scenario is what God was bringing to pass as Jeremiah prophesied. Even so, any individual Israelite could have trusted God and receive His blessing for that trust. Indeed, Daniel and his friends, to name a few, did trust God and receive His blessing in the land of Babylon. Nevertheless, this lesson isn’t an example of what we will experience in our lives if we fail to obey. It is the historical account of God’s dealings with Israel as He fulfilled all His promises to them. Once again we are brought face-to-face with the reality that this lesson assumes and equates Adventism with Christianity. This assumption if false. For am I now seeking the approval of man, or of God? Or am I trying to please man? If I were still trying to please man, I would not be a servant of Christ (Galatians 1:6-10). Adventism adds to the simple gospel of the Lord Jesus’ death, burial, and resurrection by requiring Sabbath-keeping and adherence to the Ten Commandments specifically. It is also a false gospel on the basis that the Jesus they teach could have sinned and could have failed in His mission. For in him all the fullness of God was pleased to dwell, and through him to reconcile to himself all things, whether on earth or in heaven, making peace by the blood of his cross (Colossians 1:19-20). For in him the whole fullness of deity dwells bodily, and you have been filled in him, who is the head of all rule and authority (Colossians 2:9-10). Adventism cannot compare itself to Jeremiah or to the people of God—or even to Christianity in general—because they have a different gospel and not the true gospel of the Lord Jesus as taught in Scripture. Adventism is not a biblical religion even though it uses the Bible for its proof-texts to support its doctrines. The need of Adventists is to clearly see who Jesus is and what He has done and top be willing to let all else go so that they might embrace Him and go where He wants them. Jesus is the Son of God who was the Perfect and Substitute Sacrifice for our sin. He became sin for us so that we might become the righteousness of God in Him (2 Cor. 5:21). Jesus keeps all the requirements for God’s demands upon mankind. Jesus and the Father are the participants in the New Covenant: Jesus, who has the perfect righteousness of God (because He is God) keeps all the righteous commands of God including becoming the complete Sacrifice God demands for sin. He breaks the curse of sin by shattering death from the inside-out. Because He was sinless and infallible, He could not remain dead. Righteousness cannot eternally die. He took the curse that described the heart of the law and paid the price for human sin, but then He rose from death. When we acknowledge that we are unable to avoid sin, no matter how much we pray and trust God, when we repent of our sin and ask the Lord Jesus to be our Lord and Savior, our sins are forgiven at that moment. We are filled and sealed with the Holy Spirit (Eph. 1:13-14), and we pass at that moment from death to life (Jn. 5:24). We are hidden with Christ in God (Col 3:3). We are seated with Him in heavenly places (Eph. 2:6). Adventists need to know the gospel. They need to settle once and of all the question of authority—that the Bible is God’s only word to us. No extra-biblical prophet can hold authority in our understanding of Scripture. The Holy Spirit, the Author of Scripture, is the One who interprets it to us—but only if we are born again. Only if we are indwelt by the Holy Spirit can we expect to have the Bible make sense to us. Adventists need to know the gospel, and they need to repent and receive the Lord Jesus ALONE for their salvation and reconciliation with God. They need to trust Scripture and know that the loyalty to which we are called is not to the law or to a day or to a prophet. We are called to let go of everything we love for the sake of following Jesus. 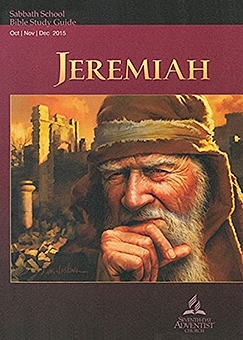 Jeremiah was doing God’s will, and he suffered deeply. He lamented to God, but he persisted in doing God’s will. Adventists may be sincere in there belief that they have the truth and are obeying the Bible, but in truth they are following a man-made gospel. Suffering for the sake of Adventism does not prove that Adventism is truth. Only when we suffer for the Lord Jesus Himself are we suffering for truth. For this is a gracious thing, when, mindful of God, one endures sorrows while suffering unjustly. For what credit is it if, when you sin and are beaten for it, you endure? But if when you do good and suffer for it you endure, this is a gracious thing in the sight of God. For to this you have been called, because Christ also suffered for you, leaving you an example, so that you might follow in his steps. He committed no sin, neither was deceit found in his mouth. When he was reviled, he did not revile in return; when he suffered, he did not threaten, but continued entrusting himself to him who judges justly. He himself bore our sins in his body on the tree, that we might die to sin and live to righteousness. By his wounds you have been healed. For you were straying like sheep, but have now returned to the Shepherd and Overseer of your souls (1 Peter 2:19-25). I urge you, dear reader, to ask God to show you what the Bible says without seeing it through an Ellen White filter. Ask Him to teach you Truth and to grant you salvation and life in Jesus! Copyright 2015 BibleStudiesForAdventists.com. All rights reserved. Revised October 21, 2015. This website is published by Life Assurance Ministries, Camp Verde, Arizona, USA, the publisher of Proclamation! Magazine. Contact email: BibleStudiesForAdventists@gmail.com.